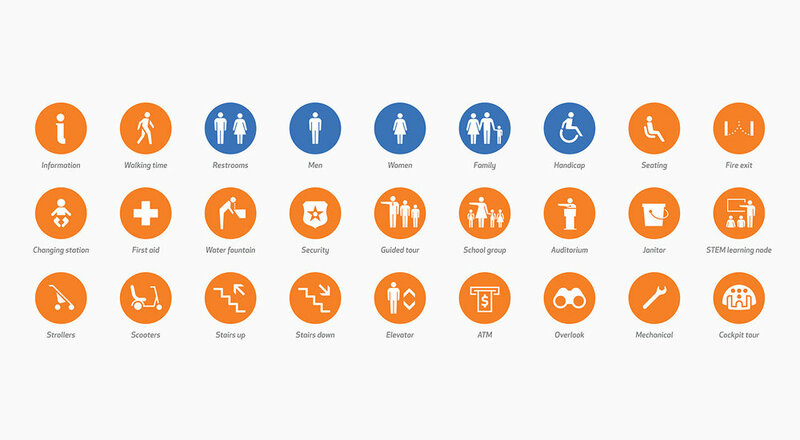 A comprehensive wayfinding audit and plan focused on user experience. The National Museum of the United States Air Force (NMUSAF) features over 17 acres of exhibit space and welcomes over one million guests annually. In order to improve the overall visitor experience and navigation, MKSK was hired to conduct a comprehensive wayfinding audit and to make recommendations for ways to improve navigation through the museum. The goals of the audit were to understand how the visitor experience could be improved through a comprehensive wayfinding system and to provide recommendations toward an effective wayfinding strategy across digital, print, and sign media. The audit included detailed review of pre-visit information and the NMUSAF website, vehicular wayfinding on roadways and on premises, interior and exterior pedestrian wayfinding on premises, and interviews with visitors, staff and volunteers. Observations were documented and analyzed based on several factors, including: continuity of wayfinding system components, consistency of messaging and design, usability of system components, branding/identity, maintenance, and information management. MKSK's recommendations became the basis for a new wayfinding system focused on identifying key facilities and simplifying visitor understanding of building circulation. The primary circulation spine was reinforced with overhead signs providing primary wayfinding information, directing to galleries, special exhibits, restrooms, and dining. 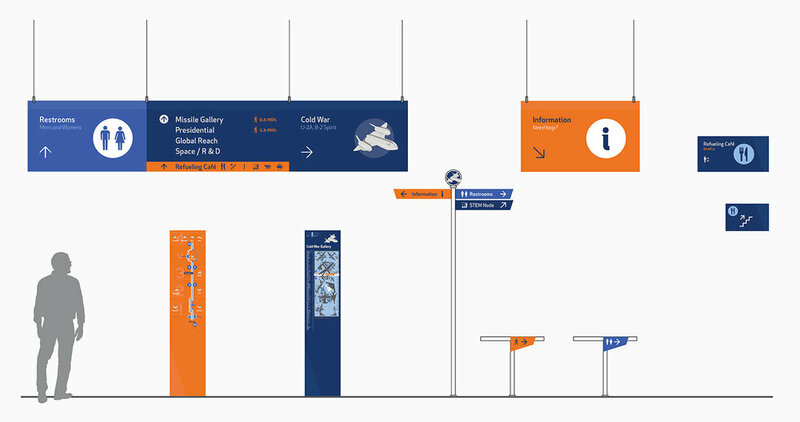 Supporting information such as walking times were included to further help facilitate visitor decision making, while supporting environmental graphics, strategic changes to exhibit locations, improvements to lighting, and the development of You Are Here and Self-Guided Tour maps all work in concert to promote efficient visitor circulation. The sign system is being fabricated and implemented by the museum's in-house exhibit department. Completion is expected in the fall of 2018.